Come out for an evening of creativity, coffee, refreshments and connecting with women in our community! 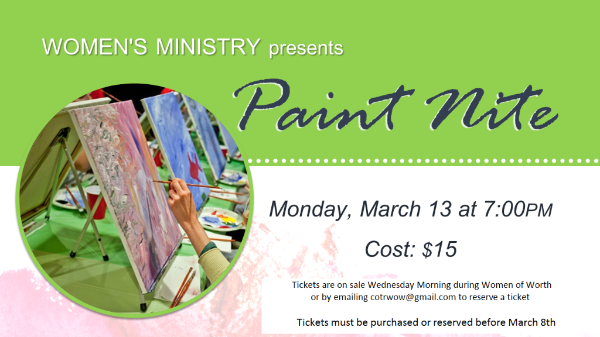 We are hosting our first Paint Nite on March 13 @ 7 p.m. Cost is only $15 for all your supplies as well as the snacks! Any skill level welcome – we will all be learning and painting together! Tickets for sale after WOW this Wednesday or by emailing cotrwow@gmail.com to reserve your spot! A huge to than you to Anna-Marie for overseeing the WOW Childcare this session and to all off our incredible workers!